2008 World Champion, Alessandro Ballan, appears to still be suffering from the curse of the rainbow jersey - and he's not even wearing it anymore. The rider endured a forgettable season in the arc en ciel, made a high profile switch to BMC for 2010, but found only more misery. The first half season proved to be a complete wash for the Italian, but the second half is looking up - it surely couldn't get any worse. 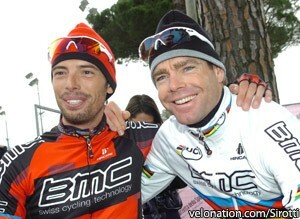 Ballan recently spoke with Italy's pink paper, La Gazzetta dello Sport, about his painful 2010. Ballan is finally returning to racing following a two month vacation imposed by his BMC team after he and his teammate Mauro Santambrogio were implicated in a doping investigation. Both were eventually cleared, but the spring was lost, and for the former podium finisher in Roubaix, so was another shot at Paris-Roubaix. "I had two months away. I explained my position to the investigation, with the team, and the with the judges, but I had to give up the first part of the season. And there I left a piece of my heart." Ballan wasn't pulled from racing until right after the Tour of Flanders, where the 2007 winner of the race finished a rather innocuous 35th place. For Ballan, however, the Sunday after was what really excited him: Paris-Roubaix. He didn't get the chance though, not then, and not for another two months. "Flanders had not gone poorly, but I was relying entirely on Paris-Roubaix, although beating Cancellara would have been hard. I'd have finished in the top 10 though. However, for the second consecutive year, I was forced to miss the race. You do not have any idea how much I like that race, and how much I mind not racing. And then I had to skip the Giro d'Italia, and that was the worst." Ballan continued to train in the midst of the chaos around him, hoping in vain, to be cleared in time for his big appointments. "At first, I trained because I was waiting to race Roubaix. Then I trained, because I hoped to do the Giro. I continued to train three to four hours a day, but without any specific work. There was just not much motivation." Eventually, Ballan's number was finally called, and he was able to return to racing. His comeback was quiet, but has seen Ballan steadily improving - culminating with a top 15 in the final stage time trial at the Tour de Suisse. Ballan was pleased with his team's performance in its home tour: "After the Giro, the team faced a lot of criticism, but this time, the team was excellent: two stage wins with Burghardt, three jerseys, a fourth place overall with Morabito…all without Evans." Ballan was sad to miss his country's Grand Tour, but is ready to take the start in his fifth Tour de France. "I had seen and studied the Giro, but I know little or nothing about the Tour this year. I know there's the opening prologue in Rotterdam, then the Alps, then the Pyrenees with the Tourmalet, and then there's Paris. This will be my fifth Tour though, so I know what to expect: hard work, more than in other years, because this time, we also have to hopefully help Evans win. I will see, and live, day by day." Up next for Ballan will be a start in the Italian road race championships. "I did not want to race it. I thought it would be more useful to spend a period of training at altitude in preparation for the Tour, but I also need racing."